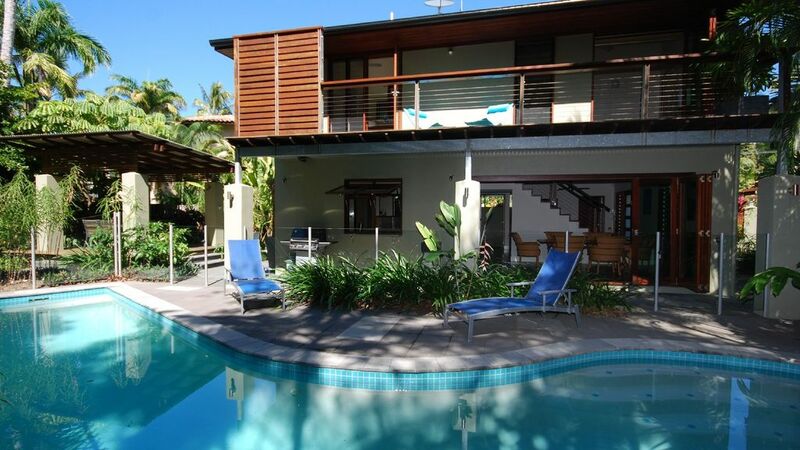 Located right on Four Mile Beach, in the peaceful residential area of Solander. The Leilani Villas are two modern, stylish villas offering ideal family accommodation, with an emphasis on privacy and lifestyle. On the beach side of the Boulevard, each villa has direct access to the beach along a private pathway through the rainforest foreshore. Leilani Tiare (Villa B) is closest to the beach at the back of the block. Architecturally designed, the villa exudes a feeling of spaciousness and light with beautiful timber floors and features. The villa has a large open plan living and dining area with comfortable lounge chairs and a dining table to seat eight. The media centre has TV, DVD and Foxtel in addition to a WiFi internet connection. There is a second TV upstairs in the master bedroom. Outdoors a private pavilion style entertaining area, perfect for alfresco dining, overlooks the fully fenced swimming pool. The pool is heated during the winter months. A central staircase leads up to the sleeping accommodation which consists of three large bedrooms on the upper level. There is carpet, air conditioning and built in storage in each of the rooms. The master bedroom has an en suite with bathtub and shower, there is also access to the deck which has an extra external shower with a view over the pool and beyond to the rainforest foreshore. The second and third bedrooms both have two single beds, which can be joined to make a king bed. These two bedrooms share a bathroom.